Flossing is encouraged to be part of one’s oral hygiene regime but there is no universally accepted oral hygiene device. The appropriate oral hygiene regimen is determined according to the dictates of the oral condition, personal preferences, dexterity, and lifestyle. Inter-dental devices are alternatives to dental flossing however adequate instruction in the use of any recommended device must be provided. Through a comprehensive history of toothpicks, it had been suggested that toothpicks are one of the earliest and most persistent “tools” used to “pick teeth.” The toothpick may date back to the days of the cave people, who probably used sticks to pick food from between the teeth. The nobility and the affluent used elaborate toothpick kits of metal, ivory, and carved wood; the less affluent whittled sticks for the same purpose. 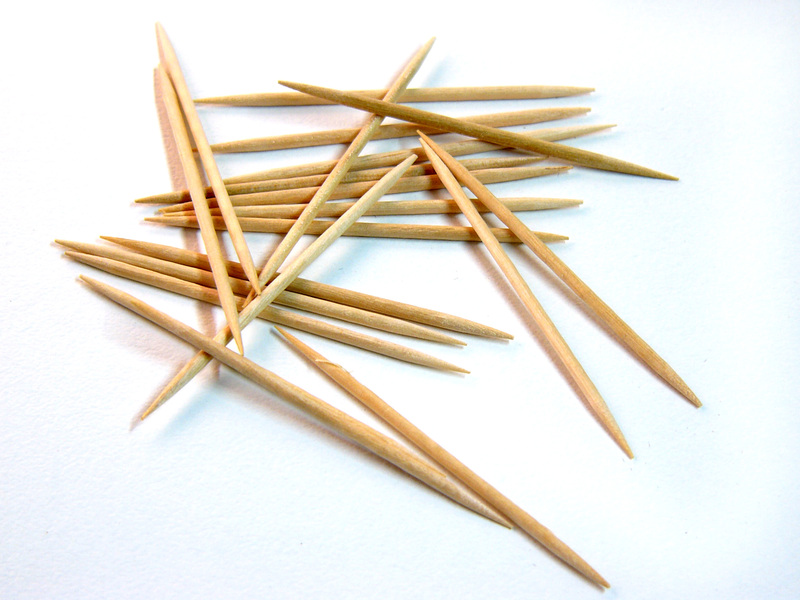 Toothpicks are utilized along the grooves inside the cheeks and in the surface in between teeth to dislodge food debris and plaque. Consistent use of the toothpick can result in firm, resilient tissue in the mouth. Toothpicks are generally considered easier to manipulate than floss and indeed are used more than floss for oral hygiene. A drawback with the usage of a toothpick is the possibility of contributing to receding gums, blunting the gums in between teeth, or causing even more severe damage with splaying of wood ends or improper use. Recommended use of the toothpick is with the toothpick holder and is an important aspect of oral hygiene self-care instruction. Although a toothpick may be manipulated by hand, the toothpick holder is a handle designed to increase effective application of the traditional toothpick by holding it securely at the proper angle. It also serves as an extension of the fingers in hard-to-reach areas. In particular, toothpicks in a handle have been suggested for cleaning the inner surfaces of the area in between the back teeth. Removal of plaque is achieved by tracing the gum margin around each tooth or root area, and in each area between teeth with moderate pressure. The toothpick is moved back and forth between the teeth at the outer and inner aspects to remove plaque and stimulate gum tissues. Application of chemotherapeutic agents (such as burnishing fluoride into the tooth to treat hypersensitivity or delivering chlorhexidine into the gumline). When using a toothpick to remove plaque, it may be pre-moistened with saliva to soften the wood, just as with the wood stick. 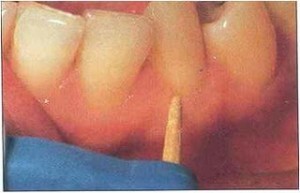 When applied to the gum margin, the blunt tip is placed perpendicular to the long axis of the teeth. As previously mentioned, care should be taken to avoid insertion into the gum pockets or vigorous use in between teeth because of potential damage to the gums or teeth. 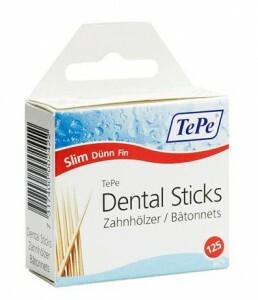 Sticks made of wood or plastic can be facilitated to clean in between teeth. Balsa and birchwood are most common since they are pliable. 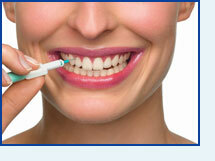 They are best suited where the gums do not completely fill the space between teeth. These sticks are triangular in cross section to slide easily between teeth and to reduce potential tissue trauma. The stick is inserted between teeth from the outer aspect with the flat surface, the base of the triangle, resting on the gums. The tip of the stick is angled towards the crown of the tooth and is moved in an outer to inner direction. Wooden sticks have an advantage over plastic in that the pointed end can be softened in the mouth by moistening it with saliva. A softer stick can be more easily adapted to the in-between-teeth surfaces. The stick should be discarded if the wood becomes splayed as splinters could be forced into the gum tissues. Plastic sticks can be thoroughly washed and reused. Resurgence in the popularity of wood sticks has prompted recent marketing of design variations from the traditional triangular wood sticks. One such model is a fabric coated or “flocked” plastic stick. This entry was posted in Oral Care and tagged dental flossing, flossing, inter-dental devices, oral hygiene, plaque, toothpick, toothpicks, wooden sticks on November 23, 2011 by oileng.